Complete lattices and fixed-point theorems.Complete lattices. Least upper bounds and greatest lower bounds. Complete lattices. Some algebraic properties of lattices.Symmetry in lattices. Sublattices. Boolean algebras. Products of lattices. Functional lattices.Fixed-point theorems. Monotonic and continuous mappings. Fixed points of a function.Nested fixed points. Duality. Some properties of fixed points. Fixed points on product lattices. The replacement lemma. Beki&ccirc; principle. Gauss elimination.Systems of equations. Conway identities. Bibliographical notes and sources. The mu-calculi: Syntax and semantics. mu-calculi. Functional mu-calculi. Fixed-point terms. Syntax. The mu-calculus of fixed-point terms.Semantics. Quotient mu-calculi. Families of interpretations. Variants of fixed-point terms. Powerset interpretations. Alternation-depth hierarchy. Clones in a mu-calculus. A hierarchy of clones. The syntactic hierarchy. The Emerson-Lei hierarchy. Vectorial mu-calculi. Vectorial extension of a mu-calculus. Interpretations of vectorial fixed point terms. The vectorial hierarchy. Vectorial fixed-point terms in normal form.Bibliographic notes and sources. The Boolean mu-calculus. Monotone Boolean functions. Powerset interpretations and the Boolean mu-calculus. The selection property. Finite vectorial fixed-point terms.Infinite vectors of fixed-point terms. Infinite vectors of infinite fixed-point terms. Bibliographic notes and sources. Parity games. Games and strategies. Positional strategies. The mu-calculus of games. Boolean terms for games. Game terms. Games for the mu-calculus. Games for Boolean terms. Games for powerset interpretations. Weak parity games. Bibliographical notes and sources. The mu-calculus on words. Rational languages. Preliminary definitions. Rational languages. Arden's lemma. The mu-calculus of extended languages. Nondeterministic automata. Automata on finite words. Automata on infinite words. Parity automata. Recognizable languages. McNaughton determination theorem. Terms with intersection. The mu-calculus of constrained languages. Duality. Interpretation of terms by constrained languages. Recognizable constrained languages. Bibliographical notes and sources. 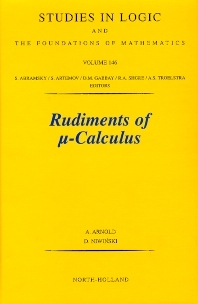 The mu-calculus over powerset algebras. Powerset algebras. Semi-algebras. Powerset algebras. Logical operations. Modal mu-calculus. Homomorphisms, mu-homomorphisms and bisimulations. Bibliographic notes and sources. The mu-calculus versus automata. Automata over semi-algebras. Informal description. Basic definitions. Hierarchy of indices. Dual automata. Relation to classical automata. Automata in the mu-calculus perspective. The mu-calculus of automata. The interpretations as homomorphism. Equivalences. From fixed point terms to automata. From automata to fxed-point terms. Conclusion. Bibliographic notes and sources. Hierarchy problems. Introduction. The hierarchy of alternating parity tree automata. Games on the binary tree. Alternating automata on trees. A diagonal argument. The hierarchy of Mostowski indices for tree languages. Universal languages. Weak alternating automata. Bibliographical notes and sources. Distributivity and normal form results. The propositional mu-calculus. Guarded terms. Introductory example. Guarded terms. Intersection-free terms. Definition. A syntactic notion of intersection. The powerset construction. The vmu case. The simulation theorem. McNaughton's Theorem revisited. The simulation theorem. The Rabin complementation lemma. Bibliographic notes and sources. Decision problems. Disjunctive mappings.Decidability of emptiness for disjunctive mu-terms. Compact lattices. Disjunctiveness of fixed-points. Emptiness of nondeterministic tree automata. The regularity theorem. The satisfiability over powerset algebras. Bounded decomposition. Tree models. Finite models and decidability. Bibliographic notes and sources. Algorithms. Evaluation of vectoral fixed-point terms. A naive algorithm. Improved algorithms. Winning positions and winning strategies. Computations of winning positions. Computations of winning strategies. Bibliographical notes and sources.